Sore feet? Painful arches? Plantar Fascitis?! Are you waking up in the morning hobbling out of bed? Finding walking, running and doing stairs painful? Are you trying to stay healthier, lose weight and get fit only to be frustrated by not being able to because of pain on the bottom of your feet? You may have plantar fascitits or fasciosis. Plantar fascitis (PF) is a condition of inflammation on the bottom of the foot, in particular the plantar fascia, which is the fascia or fibrous, connective tissue that attaches from the bottom of the heel or calcaneus to the phalanges or toes of the foot. The PF has a protective function for the underlying muscles, blood vessels and nerves of the foot. It also has a supportive role making up the three weight bearing arches of the foot: the medial longitudinal arch, the lateral longitudinal arch and the transverse arch. You may have heard the term "dropped arches". This is referring to failed integrity of these arches. Dropped arches can lead to the formation of inflammation on the bottom of the foot via a stress effect or pulling of the plantar fascia. Patient seated. Integrity of medial arch is seen. Patient weight bearing. Notice loss of medial longitudinal arch. Patient weight bearing. Pronation & valgus bowing of Achilles tendon is seen. PF usually presents as pain on the bottom of the foot especially near the inside edge of the bottom of the heel and along the medial or inside arch. Commonly the pain can be worse upon getting out of bed in the morning but improves with subsequent steps. The problem will often present more with standing on one's feet for prolonged periods, walking for extended periods, compressive activities or sports, such as volleyball, running, and with wearing non supportive shoes or sandals, e.g. flip flops, sandals and high heeled shoes. Many now believe a chronic state of plantar fascitis eventually becomes plantar fasciosis, or degeneration of the plantar fascia tissue. This most likely occurs due to an ongoing inflammation causing eventual degradation of the tissues on the bottom of the foot1. So what causes PF? When one studies the anatomy of the foot and posterior line of the lower leg, the attachments of both the plantar fascia to the inferior aspect of the calcaneus (heel) and the Achilles tendon (the conjoined tendon of the gastrocnemius and soleus muscles of the calf) to the superior, posterior aspect of the calcaneus - it is apparent that these two tissues/areas would influence each other. It is no wonder that tightness in the calf muscles could then create a pulling effect on the plantar fascia below via the common bony attachment site of the calcaneus. Commonly, runners and bikers as well as office workers who sit a lot will often have very tight calf muscles. Dropped or failed medial longitudinal arches will obviously create an elongation and stretching of the PF. Combine this with shoes with poor arch support and an irritation of the PF can easily develop. Obesity has been identified as a contributing factor to the development of PF, especially of chronic heel pain 2 . The feet are the base or the foundation of our structure, supporting our entire frame especially with weight bearing postures or standing. Added weight to our frame will have a multiplying effect on the demand of the plantar fascia for supporting the integrity of our arches. The more weight our arches support the more likely the PF will be tractioned and stretched. Subsequent inflammation will likely develop in between and above the fibers of the PF connective tissue. My primary doctor friend always used to say to me "the apple never falls far from the tree". I find this is the often the case with inheriting our parent's system, organ or tissue weaknesses. One can inherit our parent's low arches, flat feet or overpronated feet or even their high instep or supinated feet. If one or both of your parents have dropped arches, you may be headed for the same especially as age has its "drooping" effect on our bodies. Finally, it is commonly believed by many different medical authorities (medical orthopedists, podiatrists, chiropractors, physical therapists, osteopaths, etc.) that overpronation and abnormal motion of the foot is the major instigator for development of plantar fascitis or fasciosis3. Now that we understand more about the beast of plantar fascitis and its causes, what can we do to tame this beast? Stay tuned for a follow-up article on just this subject! 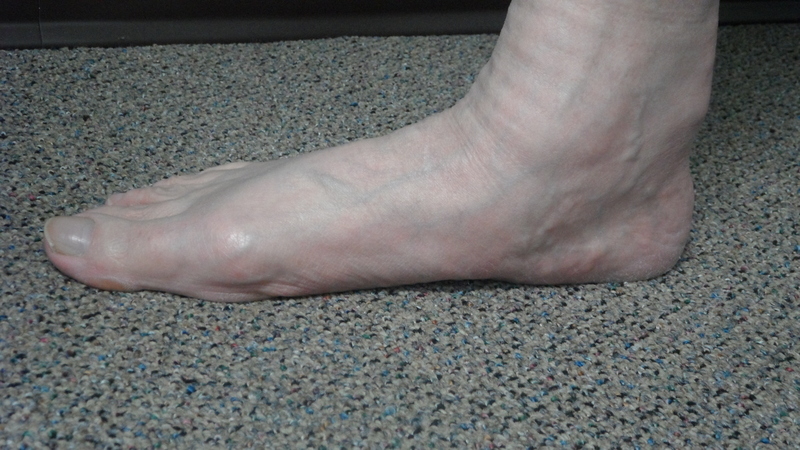 References: 1. www.northcoastfootcareblog.com/plantar-fascia-tear. 2. Irving DB, Cook JL, Young MA, Menz HB. Obesity and pronated foot type may increase the risk of chronic heel pain: a matched case-control study. BMC Musculoskeletal Disord. 2007 May 17; 8 (1): 41. 3. Kwong PK, Kay D, Vover RT, White MW. Plantar Fascitis: Mechanics and pathomechanics of treatment. Clin Sports Med. 1988: 7: 119-26.